Like its 3-sided counterpart, the 4-Sided Nestable Roll Container is designed to maximize your storage space. This roll cage container comes standard with a space saving ‘A’ frame base. 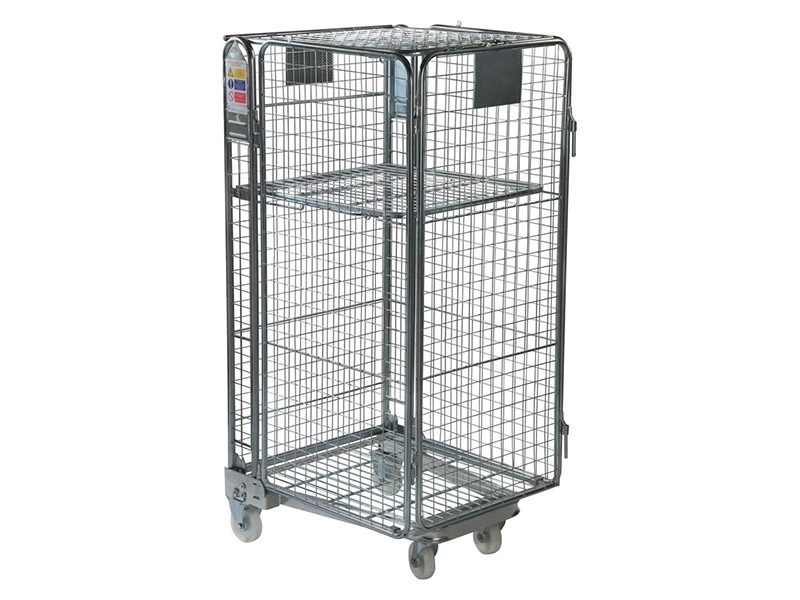 The roll cage container comes in the standard 4-sided nestable model with security mesh infilled sides. Perhaps you’re looking for something with a little extra security. In that case, this security enclosed version is the best choice for you. Where Can this Security Cage be Used? The 4-Sided Nestable Roll Container has similar uses to its 3-sided counterpart. It can come in handy in warehouses and distribution centres for smaller packages, but it is also useful in retail environments such as supermarkets. 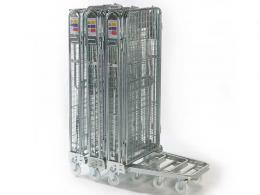 During restocking hours, this nestable roll cage is great for navigating narrow aisles. The metal cage design also makes the 4-Sided Nestable Roll Container perfect for keeping products in place, reducing spills and damage. During customer hours, it can easily be folded up and stored to save space. Who Might Use this Security Cage? Employees in retail settings such as supermarkets will find the 4-Sided Nestable Roll Container perfect for restocking shelves and moving products. Its folding ability leaves plenty of room for storage of products and other items important to your business. 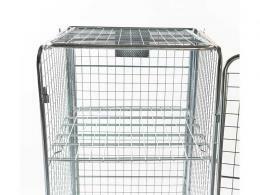 The 4-sided cage provides extra security for your employees and your products. The 4-Sided Nestable Roll Container has a 600kg capacity. Its bright zinc plated finish keeps it looking brand new and corrosion-resistant. It has a space saving ‘A’ frame base nestable roll pallet, a reinforced wire base and side panels with security mesh infill. The security enclosed version features 3 sides plus a door and top. The Workplace Depot offers a 1 year standard warranty on parts and labour for our metal cages, adding significant value to your purchase.